From 48 to 114 € the night I book ! 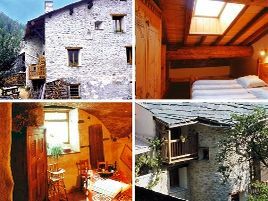 A moment of pure pleasure awaits you in Catherine and Christian's lovely 16th century home, restored to its former glory with larch floorboards and traditional Savoyard furniture. Superb rooms and suites, forming small family appartments. Tasty breakfasts with home-baked bread and succulent local-style dinners. A warm welcome to a place where you can really relax, helped by magnificent views over the Vanoise National Park. Themed breaks offered, in summer and winter..
3 suites and 2 rooms with bath or shower, WC and TV. 48 euros (1 pers. ), 64 euros (2 pers. ), 99 euros (3 pers. ), 114 euros (4 pers.). Extra bed 15 euros. Baby equipment, games, children's meals. For teenagers: skiing, rambling, mountain biking, the 'via ferrata'. The closest station is Modane TGV, located at 3 km. The closest airport is Chambéry Savoie, to 100 km.